Have you guys heard of the saying, “Every­thing old is new again”? Wood has not escaped that par­tic­u­lar cliché though that saying applies to music and fashion style, too. You can do a lot of things with wood burning tools: style your home with rustic touch or decorate wooden items like regular old wooden spoons. They make a great handmade presents for special occasions. Now that Christmas is fast approaching, we're all psyched about what gifts we could give to our friends and family. If you are up for a challenge or you want to try something new, these DIY projects are perfect for you! On that note, we have rounded up 15 DIY wood burned creations that you can make with your friends plus kids could help with the design ideas, too! So go and grab your etching tool and let’s get started. Create your very own custom wood sign and hang it on your wall to add that classy and rustic feel. Here's the step by step tutorial via Swankee Yankee. Be unique and fashionable! Turn popsicle sticks into chic wood burned bracelets! Learn how to make this easy DIY craft via Happiness is Creating. Spice up the doll house with a touch of rustic DIY wood burned doll blocks! Ask your kids to help design each block. Try this great non-toxic way to decorate wood toys via Made by Joel. This beautiful little box can be a gift or even used to store your gift! This is truly a wood burning art. Check out the tutorial at Alisa Burke. Be fashionable with these unique DIY post earrings using only twigs. Get creative with simple supplies! See the tutorial at Alisa Burke. Create a whimsical little city with these unique wood burned blocks. This inexpensive DIY project is a sure winner to your kids! See the tutorial via Alisa Burke. These simple garden markers are not only budget-friendly, they're also easy to make, an easy wood project. Learn how to make your own via SoElectric.com. These colorful little collection of handmade buttons are fun and make a beautiful accent on your outfit. A cute little wood craft you can try. Check out the how-to via Alisa Burke. Turn a little bit of wood into a lovely gift box or use it as a place to stash any of your tiny treasures . This is a great upcycling idea. Make your own secret hidey box with these easy step-by-step instructions at Brooklyn Limestone. Avoid cross contaminating your food and food poisoning by making these DIY color-coded cutting boards! They're attractive and fun to make. A great use of wood burning! See tutorial at Dream A Little Bigger. Display these crafty DIY wood burned spoons on your cupboard or use them as a gift! Check out how to make one at CherishedBliss.com. These little tokens of love are so easy to make, customizable, and sweet as can be. (Plus, it's inexpensive!) A great gift idea perfect for anyone. Get the tutorial at Design Mom. Personalize and get crafty with your wood coasters by wood burning them. You can sketch with pencil first or you can free-hand your design! Check out the full tutorial at Lisa Loves John. You'll absolutely like the charm of this simple DIY project. It's simple, fast and unique. Make your own rustic Christmas ornament via Crafts Unleashed. Leave some of these on your kid's lunch box or your husband's table and they'll be surprised. Create wooden sweet notes for your special someone with these adorable do-it-yourself craft! Driftwood is perfect for wood burning because they're soft. See the tutorial plus some wood burning basics at Lil Blue Boo. There you go crafters! 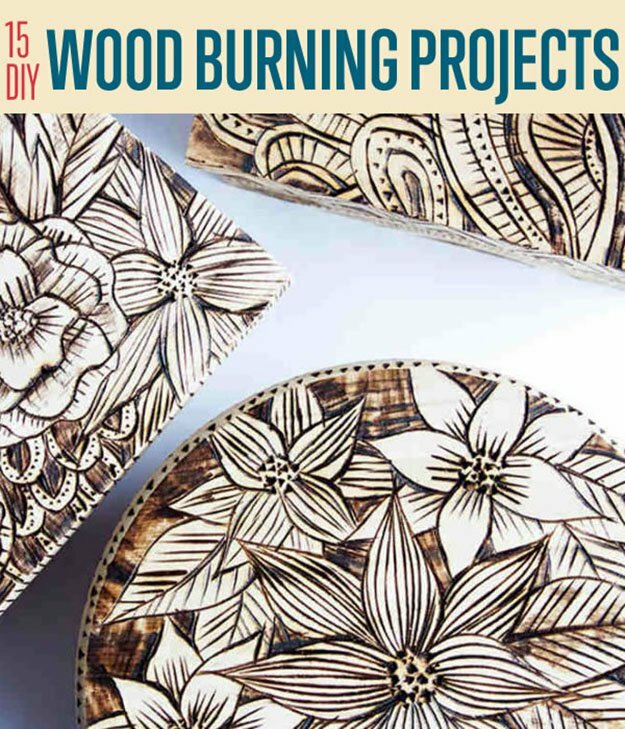 Did you enjoy our amazing list on wood burning crafts? Let us know in the comments section below what your thoughts are on these wood projects. Do you have any other wood burning projects you’d like to share? Share it with us and we’ll give it a try. We love doing cool DIY projects by making craft projects, home decor projects, upcycling ideas, recipes, tutorials and anything you can do yourself. That’s why we created this site, we want people to be more in touch with their creative side and realize that there’s a lot of things that they can do themselves. We’d love to hear from you and create a community of DIY enthusiasts where any project is just a click away. Stay connected with us on Facebook,Twitter, Pinterest and Instagram! Thanks so much for sharing my wood-burned coasters! They are so easy and fun to make!